Summary: Geometry Wars clones are all the rage right now as the trippy shooter calls back to simpler shooting days while bringing modern eye-candy. 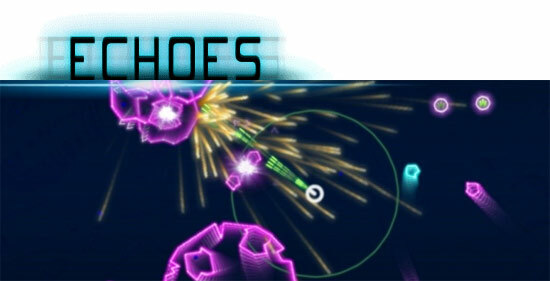 Echoes from Binary Zoo Studio takes a very similar approach with its glowing vector graphics, but has more of an Asteroids gameplay mechanic as opposed to Geometry Wars’ Robotron roots. A dual-shock style PC gamepad is my choice of controls, but keyboard and/or mouse can also do the trick if that’s your thing. What I like Best: Much like Geometry Wars, you can get into a trance-like state while you’re “in the zone”. I also love the sound effect they use for blowing up the BIG asteroids. It has such a nice rumble on my speakers.